There are various techniques you can use to make cocktails. With the basics in your back pocket, you're free to experiment. Shaking a cocktail serves two purposes: blending and chilling. Fill a cocktail shaker about half full with crushed ice. Put the lid on tight, making sure you have both the strainer lid and the cover for the strainer. The shaker will get cold, so it's helpful to hold it in a towel. Place one hand at the base of the shaker and the other on the lids, holding the lid in place. Shake vigorously for one or two minutes. Remove the lid from the strainer. Strain through the strainer into a chilled cocktail glass. A vodka martini is a classic shaken cocktail. A kamikaze is a classic sour shaken cocktail. Jolly Rancher cocktails are sweet, sour, and shaken. Add whatever it is you will muddle. Muddled ingredients are typically things like fresh herbs, sugar, fruit juice, fresh fruit, citrus zest, or bitters on a sugar cube. Hold the glass on a flat surface in one hand and a cocktail muddler in the other. 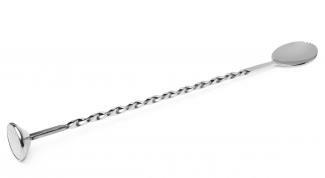 Using the wide, flat end of the muddler, work the flat surface against the ingredients and bottom of the glass in a circular pattern for a moment or two, or until the herbs or fruit release their scent. Add the remaining cocktail ingredients. Add ice and a garnish. Muddling is common in a number of cocktails. In a classic mojito, you muddle the mint with sugar or syrup before adding the remaining ingredients. In an old-fashioned, you muddle bitters with a sugar cube before adding the bourbon. The Southern classic mint julep also calls for you to muddle the mint before adding additional ingredients. Combine all ingredients with ice in a tall glass, pitcher, or a cocktail shaker with the lid off. Stir gently with a spoon for a minute to mix ingredients and chill. 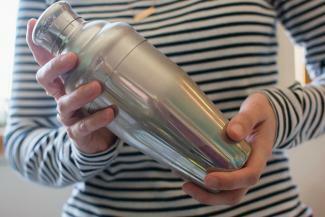 If using a cocktail shaker, strain into a chilled glass. Alternatively, pour into a glass with additional ice. "Shaken or stirred?" is a common question asked about the martini. Some people believe shaking bruises gin, which has delicate aromatics, so the flavor is negatively affected, which is why they prefer stirring. Juice drinks, like a sea breeze, are often stirred. 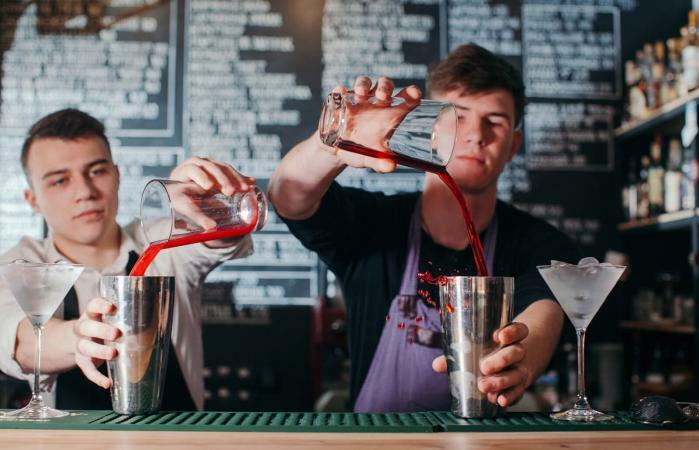 Stirring is best for drinks that contain soda or carbonated mixers, such as amaretto and coke or a Cuba libre, because shaking carbonation causes excess fizzing. Coffee cocktails, such as a Bailey's and coffee (and other cocktails like a hot toddy) are stirred, as well. 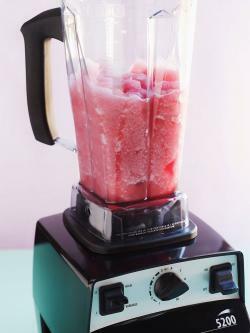 Add all ingredients to a blender with crushed ice. Pulse the blender a few times to begin to further crush the ice. Then, blend on high for one to two minutes, until smooth and frosty. Blended cocktails are often popular "umbrella drinks." Daiquiris, including a mango daiquiri, are blended. Frozen margaritas, including virgin margaritas, are blended. The tropical classic pina colada is blended. Follow the recipe exactly. Layers are ordered with the densest at the bottom and the least dense at the top. Use liquor pourers in the bottles to make pouring easier. Pour the heaviest layer on the bottom of the glass. Place a spoon over the shot glass with the convex side up. Slowly and gently pour the next ingredient over the back of the spoon in the desired amount. Repeat for each layer. The brain eraser layers vodka and kaluha. A B-52 is another popular layered kalhua drink. With just these few simple techniques, you can make a variety of cocktails. So gather your tools and mixers and have a cocktail party to show off your new skills.